WASHINGTON (CNN) - U.S. Rep. Joe Wilson - the South Carolina Republican who heckled President Obama during his speech to a joint session of Congress - has raised more than $1 million, a campaign aide confirmed to CNN Saturday. Miller - who has reported raking in more than $1 million as a result of the outburst - ran against Wilson last year, losing by 8 percentage points. It was Wilson's smallest margin of victory in his five elections to Congress. In an e-mail to supporters Friday night, Miller said he had raised the money in small contributions in less than 48 hours - a total that dwarfs the $67,000 he has taken in during the entire first half of the year. –CNN's Peter Hamby contributed to this report. Rude behavior is now encouraged...what a grand example to be setting. Knowing how politicans act for money, now all will be wanting to follow suit. Nice example we are setting...grow up. Second CNN story on this subject I've seen that headlines Wilson's fundraising and buries Miller's in the body of the story – even though Miller raised more money than Wilson. Why the pro-Wilson bias, CNN? Wait a minute... So the words, You Lie, are Bias and Racist? Yes, he should not have said them as respect to the President. However, he did apologize twice. Unlike Harry Reid who NEVER apologized to Bush for calling him those names and worse. Perhaps, if the President would have read the bills, he would have seen they were covered, and are currently covered and were covered under other versions. There is NO Attempt to remove illegals from this bill, nor is there any attempt by this Administration to remove Illegals from this Country. Maybe if he starts sending the Millions of Illegal's back to their homes, we would believe him when he says they won't be covered. Until that happens, Obama is lying. Just like the 900 Billion they will find in savings and it won't cost a cent to CREATE a new program. If it can be done now, why couldn't have it been down 9 months ago when he took office? Or how about all those years he was Senator and could have proposed something then? It's not going to happen any way you look at it. We are not that stupid to believe you can't squeeze a dollar out of a penny. The only way he is going to find 900 Billion dollars to fund this thing, is if he prints it...which has been what he has been doing since he took office. And you wonder why the value of the dollar has fallen? the money raised is NOT, in any way, correlated with the voter opinions in this considerably rural, 70% WHITE district. Miller's racist views are undoubtedly supported by these losers of the Civil war, most of whom are still angry about it. This racist condemned Strom Thurmond for ADMITTING he had a biracial child...so he believes such a horrible deed should be hidden. The money to the Dem's campaign coffers is coming from throughout the country. Racist Miller's influx of cash, no doubt, is coming from wingnut fans of the republican elite: the Joe the Plumber (who aint a licensed plumber), Sarah Palin, who is a national embarrassment, the ignorant Birthers, Racist Limbaugh, and all the freaks that discount science and don't believe in evolution. There can be no doubt, the disrespect Miller and other republicans show for our sitting president is due to their being unwilling to accept the authority of a black man. Sad, so sad. Wilson like everyone of us has the right to speak and oppose the Government , yes that also means the President. We have Freedoms in this Country that are taken for granted. If they are taken away, you would not be able to blog on this Ticker or anywhere, the things you are posting. LET FREEDOM RING!!!! This spin is hilarious! If everyone is supporting you Mr. Wilson, why is your website still shut down for messages? I went there to respectfully voice my disapproval of his comments, but you still can't send them to him. What exactly is it you're afraid of, Mr. Wilson?? What is wrong with this country? I didn't vote for Obmama and probably would ot vote for him if he ran again, but he is trying to do the best that he can with what was handed to him from Bush and Cheney. Where were the outcrys when they trampled our constitution with the belief that they were above the law. They both should be in jail. Come on america, they could have been considered Dictators! I don't agree with our President on many of his programs, but stiring up the far right nut cases with outright lies and hatred is as "UN AMERICAN" as those nut case terrorist that want to destroy us! You know the ones, they are called the Taliban and their cousin Osama. Wlson and the far right extreemist who spout family values and virtue only to be caught with their hands in the cookie jar make us laughable to the rest of the world. We need calm minds to work together to solve these problems. Get with it you knuckle heads!!!!!!!! Doesn't it seem like the bigger story is Miller's fundraising, since he has raised more money? Hmmm just wondering what old Joe has lied about all those years being a U.S. Rep? Insurance companies and racists are donating! Why is that everytime someone dares to question this administration or the democratic party, they are immediately lableled as RACIST. Disagreeing with the administration, believing that the actions they are pursuing are wrong for the country, does not make one a Racist. It's as though the once oppressed having found power have become the despot racists they fought to overcome. And people send this bum money ??? 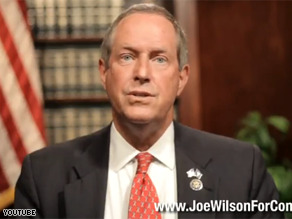 Good to see Rep. Joe Wilson to stand firm against bad policies. Even though I am an independent and 110% support this guy's guts when everyone afraid to speak about the destructive policies of Obama... because every one is afraid that they will be labeled as racist! Republicans aren't embarrassed by this man, they are thrilled by his disrespect so they send him money. This is the normal Republican. If they aren't starting wars they're disrespecting the country. The truth is there is no Republican party. It was hijacked by conservatives. A shame to this country but more importantly, a danger. I am an independent usually side with the Republicans, however, after witnessing their behavior toward President Obama since he was elected I can honestly say that I WILL NEVER VOTE FOR A REPUBLICAN. God will deal with Sean Hannity, Glenn Beck, Ann Coulter, and the rest of those clowns who promote hate. What does someone's true anger being expressed during a speech in the House and Senate Chambers have to do with race?? This entire race arguement to deflect any debate on any topic that anyone disagrees with the president is getting nauseating to say the least. 1st of all he's not BLACK, he's mixed, you know his mother and grandmother was as white as white could be. Prove to me that he was telling the truth by saying that illegal immigrants will not be covered!!! Read the bill yourself. Wow, your comments Aaron P about the KLAN indicates that you didn't stay in school, or you were highly spoonfed some historical revisionism from a lib teacher! I guess you forgot it was the democratic party who fought against school integration and a bunch of democractic whities stood there arm to arm to prevent black students from entering the schools. I guess MLK was a Republican because it was the party of racism too? You must have also forgotten it was your other king leader Al Gore's father, Al Gore Sr. who voted and blocked several key civil rights legislations during his time as a Senator. If you want to go down the path of who the racist really are, then be prepared with facts and not namecalling like a little kid on a schoolyard. You libs and your anger spewing filth like a bully is all you can do when faced with facts. I guess that's why I get entertainment from visiting sites like this to see how dumbed down the viewers of these political partisan news sites are. i'll let you get back to being spoon fed for your next diatribe issue. God Bless America!!!!!!!!!!!!!!!!!!!!!!!!!!!!! "You lie!" makes the man a racist? Are you kidding me? So, anyone who opposes Obama on 'spend and spend' policies becomes a racist? As a naturalized citizen for more than 20 years, I am appalled at what I am seeing and hearing from the liberals. Not only did Wilson behave disgracefully, but a check of his assertions proves that he's the liar, not Obama. It's time for Republicans to use facts and reason when they make an argument and to be prepared to listen to what their opponents say so that compromise can be reached. There can be no reasoning or compromise with fanatics and liars nor with the people who blindly believe the most bizarre assertions to their own detriment. Now, now, people, be tolerant. No one griped when Bush was heckled/booed by Democrats during his State of the Union speeches. I myself like the more civil congressional audiences respecting the president. However, my point here is that you can't judge an opposition party member for doing this when your own party has done the exact same thing. To call this as well as those who support Wilson "racist" shows nothing more than your own lack of rhetorical ability. Besides, didn't Obama in his speech say that the name calling has realy got to suppose. Might be a good idea to follow your leader. I am a 58-year old Black Harvard Law grad who has never submitted e-mail comments before now. The outburst by Rep. Wilson, as the many vitriolic town hall meetings around the country this summer, evince a much deeper issue and one that many appear to be delicately avoiding. There are those in the country who just have not gotten over the fact that a Black man was elected President. The health care "debate" is merely a subterfuge for what is really at the heart of the matter. The grace and dignity with which the President dealt with this latest attack is proof that the right person is in the Oval Office. I only hope that, in the end, reason will prevail over prejudice.